A crucial ingredient in Mediterranean cooking, popular in soups and sauces. 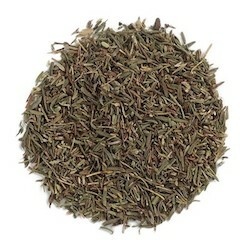 Thyme blends well with many other herbs, enhancing rather than overpowering other flavors. Use this herb to add warmth and pungency to marinades, stuffings, vegetables, fish, stews, meat and cheese dishes. Our organic bulk thyme leaf is Fancy Grade.